From November 1-15, you can hop along to participating blogs to find great family friendly giveaways valued at $25 or more! 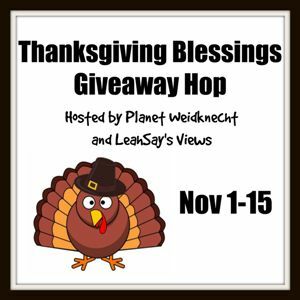 Once you enter my giveaway be sure to check out the linky below to find more great giveaways to win! Good luck!! Christmas movies are my favorite! Okay, okay...Christmas ANYTHING is my favorite, but I really do love Christmas movies. I love seeing the perfectly decorated houses on screen, I love seeing the perfectly put together meals, I love seeing the family togetherness... I just love Christmas movies. Period. One very common story among Christmas movies is meeting the parents for the first time. If you're married or have ever been in a serious relationship, chances are you know this experience very well. You want to make a great impression, you want them to like you, you want to do it all right! Add in the added pressures of the often times crazy holiday season... it's a recipe for drama... making it a recipe for a great movie! Leo has been dating Emily for quite some time, and knows he want to propose to her. The only thing is, he hasn't yet revealed to her that he is actually Prince Leopold, Duke of Winterstone, and heir to the throne of a sovereign state bordering Switzerland. When Leo's mother, Queen Isadora, finds out about Leo's proposal to an American commoner, she becomes outraged. In a series of events, she sabotages their courtship and does everything in her power to drive the couple apart. But will she succeed? First and foremost, no one does an uplifting Christmas movie better than Hallmark, right? They've got these must watch holiday films down to a science- just the right amount of drama, inspiration and perhaps a little bit of cheesiness too (and I like the cheese!). They know how to create great movies that make you laugh, make you cry and make you fall in love with the characters. When I see that a Christmas movie is made by Hallmark, my expectations are high! A Royal Christmas is available to purchase now at Family Christian. I love their toy selection!! They have tons of Veggie Tales toys that my son just loves!! I like the children's bible. I have been looking for one for my kids. I love the book My Rosary Novena I would love to read. I like the New Answers Book Boxed set. Thank you for the chance to win! I love all the beautiful mugs that they have. I would love to have one of their journaling Bibles. I like the Bible Bingo game. Christmas Begins With Christ Accent Pillow is something else that I like! I can hardly wait to see the War Room movie when it's released. I love the Joy to the World Treat Box. It would be nice to sit on the coffee table with some nice Christmas treats in it. They have so much! I really love the Little People Nativity! That would be perfect for my 2 and 3 year olds - we have been talking about Christmas being Jesus's birthday! I also love all the $5 deals! There is literally something there for everyone. They are a fantastic company! I like the On A Winter's Night cd by Jim Brickman. I really like the Rustic Christmas: 7-Piece Nativity Set. Super nice. I have ordered from them before too and they are great! I also love the Fisher-Price Little People Nativity: Deluxe Christmas Story.